Palace theatre executive director Holly Brown says project timetables are being worked out. Albany Mayor Kathy Sheehan says the plans are a demonstration of the growth the Palace is experiencing. Supporters are looking to position the Palace as a unique and impressive gateway to downtown Albany. The project entails building expanding theater's footprint along North Pearl Street, adding several new elements, including a 600-seat theater, creating a multi-faceted arts program accessible to the entire community, and establishing a state-of-the-art video post-production center. Renovations within the main theater will expand the lobby and enhance the current stage, backstage area and box office. 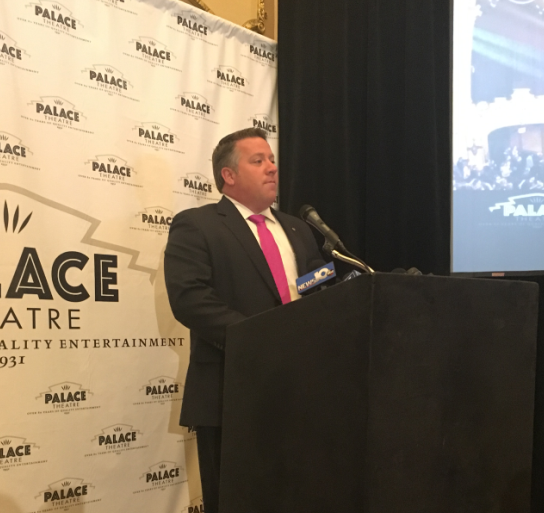 Albany County Executive Dan McCoy pointed out that since the Palace Theatre opened its doors in 1931, the venue has provided a wide array of cultural events. Albany County Executive Dan McCoy pointed out that since the Palace opened in 1931, it has provided a wide array of cultural events and served as a hub for the creative community. He praised planners and supporters of the renovation plan. "They envision not just a larger venue, but a place where through the arts we can deepen our insight and engage in our imagination and envision a better world." McCoy says projections indicate the improvements will impact downtown to the tune of $125 million, and create over 200 new jobs. Albany Mayor Kathy Sheehan says the plans are a demonstration of the growth the Palace is experiencing. "This is a theater that cares about the community, whether it’s Tuesday afternoon movies in the summertime that are free for our young people, the education programming that happens here. So to be able to expand on that here is really exciting, to create great education space, great post-production space, which is a growing industry, as well as additional flexible theater space that will allow for a smaller venue to attract more types of acts, I think that this is really a tremendous opportunity for downtown." University at Albany President Robert Jones sees an opportunity for a better connection between the uptown campus and downtown. "We've been having conversations about how we will be part of this expansion from an academic and educational and an outreach and engagement perspective, so this is why I'm here today; this is critically important." Palace executive director Holly Brown says timetables are being worked out and the planning continues. "We are applying from funding now through the state, with an application that's due at the end of the month." Brown has been holding exploratory conversations with Capital Repertory, based nearby on Pearl Street. "Cap Rep is a huge asset to downtown Albany. I think all of us would be, I know I would be very upset if they had to leave this area, so anything we can do to support their efforts, we want to do that." Ownership of the Palace Theatre building will be transferred to the Palace Performing Arts Center Inc. from the city, pending approval from the Albany Common Council. Albany is home to a vigorous skateboard culture. The Washington Park tennis courts along Madison Avenue have long been the center of the local skating community, even though the pasttime was technically illegal for some 30 years. Now, the city is going forward with an ambitious plan to build a skate park. A Syrian refugee was in Albany Thursday to take part in a panel discussion, "Facing the Global Immigration and Refugee Crisis," at The State University of New York's Rockefeller Institute of Government. The event kicked off a celebration of immigrants and cultural diversity in the area. The federal prosecutor behind the convictions of several of New York's most powerful lawmakers made several stops in Albany Monday. Preet Bharara spent an hour at WAMC’s performing arts studio.